Rove Estate Winery provided a romantic and etherial setting for this "Vindustrial" styled shoot. With a vision combining modern, vintage, and industrial flair - Birch Affair, thought up the perfect aesthetic to compliment the rolling Northern Michigan vineyards. Featuring all local, Northern Michigan Vendors, this shoot combined the intimacy of an elopement and the unmatched beauty of this region to highlight some of the wonderful wedding vendors Northern Michigan has to offer. The Elopement Announcement Suite featured watercolor brush calligraphy and custom watercolor floral designs. And the adorable vintage yellow get-away truck provided the perfect inspiration for the custom envelope liner. It was such an honor to be included among such talented Northern Michigan vendors for this shoot. They created pure magic. And a huge thank you to Nick Wisda Photography for the beautiful photographs! Alie & Tom tied the knot on the most gorgeous summer day, surrounded by lush, colorful peonies, draping greenery, beautiful stone architecture, and their closest family and friends. Their day was a beautiful mix of classic romance and whimsy, highlighted with the perfect punch of bright, summery colors. 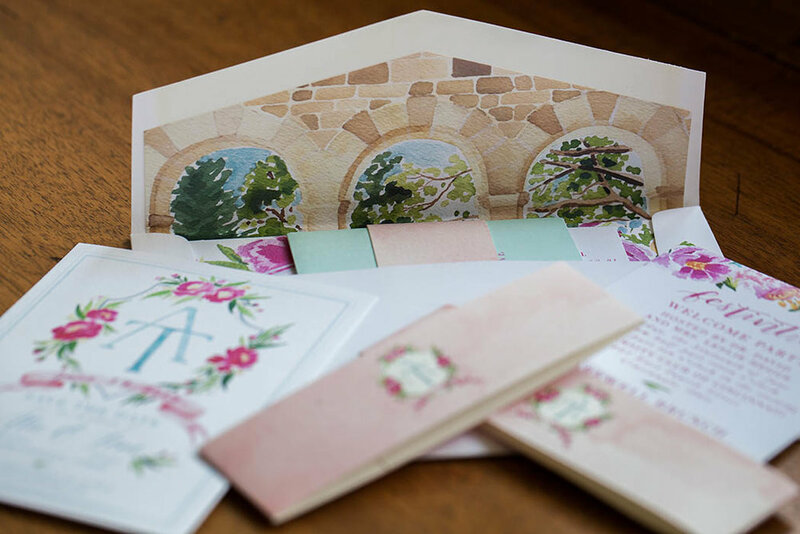 We had the pleasure of working with Alie on her custom save-the-date and wedding invitation suite, which featured a hand-painted watercolor wedding crest, custom watercolor brush calligraphy, and watercolor floral details to give her guests a peek into the beautiful day ahead. The RSVP card included small illustrations of the menu choices and floral details, and was tucked into a Tiffany Blue envelope to add a fun pop of color. The envelope liner featured a custom painting of the stone Tea House that was on the grounds of her wedding venue, and was one of my favorite details to include in the suite. The entire suite was wrapped with a custom paper belly band which subtly featured her custom wedding crest again. We also loved creating a few custom pieces for Alie & Tom's wedding day as well, including custom menus, which featured hand-painted watercolor floral details and brush calligraphy. The custom wedding crest was also featured throughout her wedding day on the throw pillow, matchbooks, and seating chart. I can't stop pouring over all of the gorgeous images captured by Nathan Peel Photography. What a perfect day!